Never Say Die: Our 18 Best-Ever Health Tips! Well, we can't help you live forever. But follow our 18 best-ever health tips, and you might come pretty close. Close your eyes. No, not literally. I want you to keep reading. But imagine a picture of perfect health. What does it look like? Do you want to see yourself in that picture? If you do, then let our 18 best-ever tips help you get there. If you really want to boost your overall health, supplement for your fitness goal. Training for a marathon? Once you get to mile number eight, you may want to think about endurance supplements and electrolyte chews. Find yourself lagging during your fifth workout of the week? Try energy boosting pre-workout supplements. Personalize your supplement program to match your goals, and your overall health will benefit. There's a reason there is such wide variety of healthy foods out there: o you can eat them all! But achieving a healthy balance is key. Former Mr. Universe and health guru Lee Labrada has a super-easy way of practicing food balance. He calls it The Rule of Thirds. One third of your plate should be home to a healthy carbohydrate; one third should be a quality source of protein; and the last third goes to vegetables or salad. For example, at dinner you could have a plate of baked sweet potato, a spinach salad, and grilled halibut or chicken. If you balance every meal, your body will learn to trust that you're feeding it the good stuff. You'll be full of energy, vitality, and promoting the longevity of a healthy body and mind! Do you know why you're always told to eat more fresh fruits and vegetables? There's actually science behind that advice, and it has to do with your body's anatomy and physiology. The human body is put under stress every day. From our cells to our organs to our skin, every piece of the anatomy puzzle ages and deteriorates. Things like free radicals and inflammation may only add to the chances of breaking down and signs of aging. But there are many foods that can help your body arm itself against the ravages of time and the stress of use. Check out the list of foods and herbs below to see how easy it is to sign up for Triple AAA nutrition every day. coffee and theobroma cacao otherwise known as cocoa! There's a famous saying in the fitness industry: "If you don't prepare, be prepared to fail." Cooking your own food takes time. Shopping takes time. If you don't cook, it takes time and money to figure out where you can eat out and still eat healthy, unprocessed foods. But it takes less time than you might think! Spend a few hours on one of your days off from work or school cooking up your meals for the week, and you can knock it out in one day! Don't be afraid to abuse the convenience of Tupperware, plastic baggies, and insulated lunch boxes. 5 / Bring On The Healthy Snacks! One of the easiest ways to improve your general health is to surround yourself with nutritious and filling snacks. Everybody snacks, so you might as well make it healthy and make smart lifestyle choices today. A few great healthy snack ideas: home-made trail mix with almonds, walnuts, dried apricots, pumpkin seeds, and cranberries; low-fat cheese with whole grain crackers; Greek yogurt with low-sugar granola; canned tuna; meal replacement protein shakes; hard boiled eggs; beef jerky; fresh fruit or veggies with nut butter; and protein bars. Portion control, natural foods, and balanced meals—don't forget that these nutrition tips apply to drinks too! Avoid the blood sugar rush and subsequent crash that'll leave you cranky, tired, and craving even more sugar by choosing to sip on zero calorie drinks. 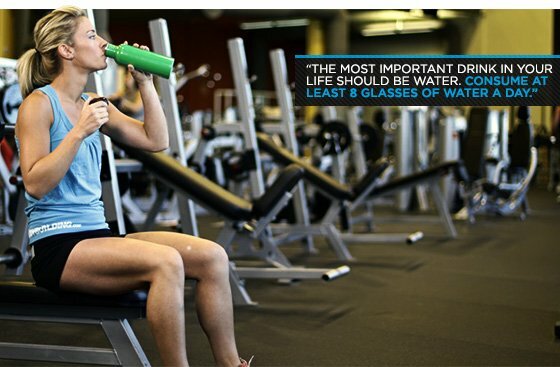 The most important drink in your life should be water. Hands down. Consume at least eight glasses a day. Other liquids to help satisfy your thirst should come from unsweetened teas (green tea is a wonderful choice), drip coffee or espresso served black or with a bit of cream, and, of course, protein shakes—delicious, nutritious, and generally low in sugars. If you need more reasons to avoid slurping a sugar-packed drink, check out the 10 drinks that will destroy your nutrition plan. 7 / Exercise Is a No-Brainer—But Don't Forget to Train for a Goal! Of course to maintain your health, you have to exercise. But many people make the mistake of exercising without a goal in mind. Without a goal, you can't have a plan of action. And without a plan, you aren't as likely to stick with a program and see results. Whether you want to radically transform your body, put on a few pounds of muscle, burn a few pounds of fat, train for a sport, or just "get fit," your goal should be measurable and attainable. Create a timeline for your goal. It could be as simple as, "I want to increase my bench by 10 pounds in a month." Or it could be as dramatic as, "I want to train for and run my first marathon in six months." Given a goal, a timeline, a plan, and a way to measure your success, you'll have no option but to stay active and stay healthy. And you'll have fun while doing it. Does the term "cardio-bunny" describe you? Or do you spend all your gym time doing bench and leg press? Maybe you only hit the gym once a week and you're looking to start a workout program. No matter where you fall on this spectrum of gym-goers, you should incorporate both weight training and cardiovascular training into your regimen in order to achieve optimal health. Weight training will help you build and maintain lean muscle, which will lead to better joint support, healthy metabolism, and a healthy overall body composition. Cardiovascular training will help you maintain a strong heart and lungs, healthy blood flow, healthy metabolism, and a normal mood. When you hit the weights, are you going through the motions? Or are you lifting to impress the other bros? Either way, you may sacrifice form, which means you're also sacrificing results. Just like pro footballers have to perform training drills with good form, the rest of us have to lift, run, jump, bend, and stretch with good form. Perfecting your form on any exercise takes mountains of concentration and focus. But it ultimately leads to fewer injuries and faster results. A great place to check on your form for any exercise is the Bodybuilding.com Exercise Database. If you're reading this article you probably won't settle for status quo health. You want exceptional health. To get there, you must reject status quo training. To keep your body in the best shape, every workout should be a challenge. Don't let your muscles, heart, and lungs adapt to the point where there is no longer progress and/or growth. And all it takes is slight adjustments. Add weight to your bench press each week. Do an extra set to really burn out. Add high-intensity intervals to your cardio sessions. Keep pushing the intensity and you'll never get bored; you'll never fall off the wagon; and you'll be in the best shape of your life for the rest of your life. 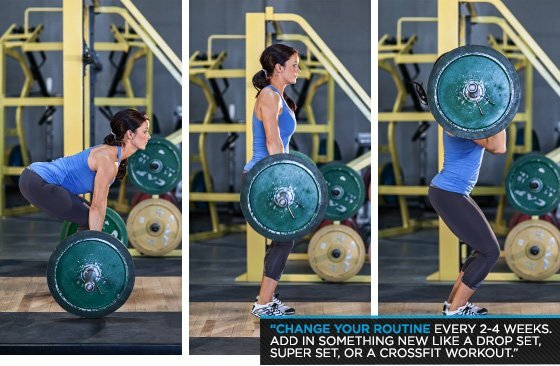 One easy way to keep your body guessing is to learn how to do new stuff at the gym. It may be new exercises, combinations of exercises, or a new way to do your normal routine. But if you always enlarge your workout vocabulary, you'll never get bored, which means you'll keep coming back. Since consistency is 99 percent of the battle for your health, you've got to keep it fun and keep it interesting. Change your routine every 2-4 weeks. Add in something new like dropsets, supersets, giant sets, circuit training, tabata workouts, or CrossFit-inspired movements. The options are endless! If you aren't familiar with the terms above, then get ready to learn, baby. You've got a massive online resource that's free and at your fingertips: the Training Articles Database. Fad diets come and go; but fitness is forever. 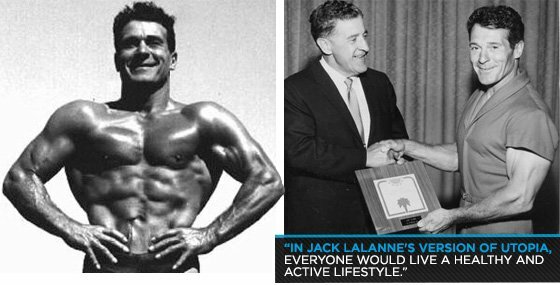 Just look at legendary fitness guru Jack LaLanne, who passed away in 2011 at the age of 96. In Jack LaLanne's version of utopia, everyone would join up to live a healthy and active lifestyle. By surrounding yourself with people who care about fitness, you'll stay motivated 24/7. Whether you train with a partner who pushes your boundaries, or you post your lifting stats on an online fitness forum, it's the sense of accountability and community that will keep you pushing for bigger and better things. Though sometimes you may feel alone when it comes to caring for your own health and wellness, there's an entire nation of people waiting to support your fitness journey. Start by creating a BodySpace account and don't be surprised if you get inspired in less time than it takes to eat a potato chip. A house is only as strong as the foundation it sits on, and the same goes for nutrition. But your busy life and high activity level may help deplete you of essential vitamins and minerals faster than you can replenish them with food alone. By adding a multivitamin/mineral supplement to your day, you'll have extra support for optimal health. Nobody eats perfectly all of the time. Well, maybe somebody out there does, but a multivitamin is still a great recommendation to start building your overall health and wellness supplement stack. 14 / More Omega-3s Please! You've seen it mentioned in this article already: omega-3 fatty acids. What's so special about them? Number one: Your body can't make these essential fatty acids; you have to get them through foods like wild salmon, flax seeds, kiwi fruit, and walnuts. Number two: Omega-3 fatty acids help support healthy brain and cardiovascular function, normal hormone levels, and may provide anti-inflammatory benefits. Basically everything inside of your body can benefit somehow from a healthy intake of omega-3s. So whether it's daily fish for dinner, a tablespoon of flax seed oil, or a supplement, getting your omega-3s will give you an edge on maintaining great health. One of the most convenient, time-saving and health-promoting supplements you can invest in is a quality protein powder. From zero-carb powders to meal replacement ready-to-drink shakes, the options are endless. With a bit of exploration, you can find a flavor and consistency that you love that also keeps you healthy! Before you grab a vending-machine snack or fast-food meal consider these factors: protein supplements can be cheaper per-serving than most snack foods; they'll fill you up better; they won't cause the spike and crash of blood sugar like processed carbs will; and they'll support the growth and development of lean muscle mass. Need any more convincing? No? I didn't think so. Go outside and play! True, we adults normally only think of saying this to children. But it's time to face the music and realize that we need sunlight and fresh air too! Even if the weather is frightful, bundle up and take a stroll. It's been shown to boost your mental health, among many other benefits. If you don't see enough of the sun, you may want to consider a vitamin D supplement. No, it's the not the bear terrorizing peanut-butter sandwiches in Jellystone Park. Yogi refers to someone who practices yoga. But really, any type of dynamic stretching time is going to greatly benefit your overall health. Stretching gets pushed to the back burner for many people when they have a specific fitness goal like losing 20 pounds or building bigger pecs. But stretching is an essential part of fitness and should be included in everybody's routine, hands down. Taking care of your connective tissues can also help with injury prevention. Besides, you can also use stretching time to de-stress, listen to your favorite tunes, and perhaps slip into a short cat nap. What could be better? I'm pretty sure "nothing" is the correct answer. Never underestimate the power of R&R. It may sound counterintuitive, but after all the activity you're going to be doing to stay healthy you've got to make time to rest and relax. Make time every week to de-stress from life's daily toil. Vary your activities and always strive to get eight hours of sleep each night. If you push relaxation to the bottom of your to-do list, you'll find your health (the mental and the physical) deteriorating faster than you can spell "Stress-Ball" backward. Take a vacation. Visit a beach. Hike a mountain. Do a puzzle. Play with your loved ones. Lie around doing nothing and forget about time. If you're ever in Rome (or any part of Italy, really) you'll realize why so many people love the saying, "When in Rome, do as the Romans do." Because Italians have mastered the art of enjoying life. They call it la bella vita, which means "the beautiful life." And by following these 18 tips, you'll definitely have earned the right to enjoy it.